Louis Jordan, alto saxophonist, vocalist, and recording artist is considered by many to be an under-recognized trailblazer in the early foundations of Rock ‘n’ Roll. Jordan was one of the first African American musicians in the 1940s to crossover from the race records industry to the popular music industry. Jordan was born on July 8, 1908 in Brinkley Arkansas. He began playing the clarinet around the age of 7 with the Brinkley Brass Band, a band coached and co-organized by his father, musician James Jordan. In 1920, Jordan left Arkansas, joining Ma and Pa Rainey’s Rabbit Foot Minstrels. This was the first in a series of engagements with different traveling minstrel shows, until in 1930, Jordan’s family relocated to Philadelphia. In 1936, Jordan moved to New York City and began playing alto saxophone in Chick Webb’s band. Jordan played with Webb until May of 1938, leaving to form his own band, Louis Jordan’s Tympany Five in August of 1938. Soon after, Jordan began recording with Decca Records and the band’s first album was released in December 1938. Jordan remained with Decca until 1954, leaving the company to sign with the West Coast label, Aladdin Records. Recording his first hit, “I’m Gonna Move to the Outskirts of Town” (Casey Bill Weldon) in 1942, Jordan gained popularity in the race records industry. Known for his upbeat, party music, Jordan’s heyday on the race charts took place in 1946 with chart-topping hits such as “Choo Choo Ch’Boogie,” “Ain’t That Just Like a Woman,” and “That Chick’s Too Young to Fry.” His first crossover hit to the popular music charts, “G.I. Jive,” happened in 1944. During this time period, Jordan’s lyrics and compositions developed the early signature sounds of what would later become Rock ‘n’ Roll. In addition to touring with his band and recording albums, Jordan made movies featuring his songs, including Follow the Boys (Universal, 1944), Swing Parade of 1946 (Monogram, 1946), and Beware (Astor, 1946), a film titled after Jordan’s song hit of the same name. Beware featured an all-black cast in which Jordan played himself, the film serving as an instrument for ten of Jordan’s songs. 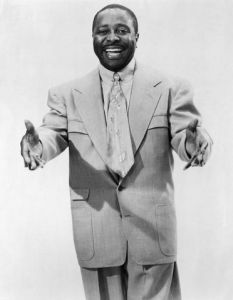 Louis Jordan’s last popular song hit, “Saturday Night Fish Fry,” was recorded in 1949, after which time he began to lose popularity. From 1951-1974, Jordan recorded six more R&B hits, did singles for various recording companies such as Mercury, the British Label Melodisc, Ray Charles’s Tangerine label, and the French label Black & Blue. Jordan recorded his final album in 1974 for Johnny Otis’s Blues Spectrum label. Louis Jordan passed away on February 4, 1975, in Los Angeles, California from a heart attack at the age of sixty-six.